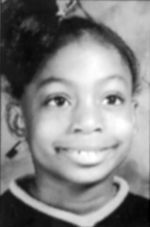 On the evening of December 16, 1993, 8-year-old Lativia Johnson was home with her family decorating for Christmas when she was struck down by a shotgun blast that came through a window of their house at 1150 Ionia Ave. SW, Grand Rapids, Kent County, MI. Posted on Friday, April 10th, 2009 at 3:26 pm. Last updated on Tuesday, January 9th, 2018 at 11:35 am.